I welcome everyone to my new format web page. If you are an old friend who has followed me for years or an new visitor I hope you have found your new fishing home. Please take time to sign the guest book so we all can get to know each other. "Best Catch Striped Bass Tournament"
The Spring 2017 edition of my "Best Catch Photo Contest" has Begun. 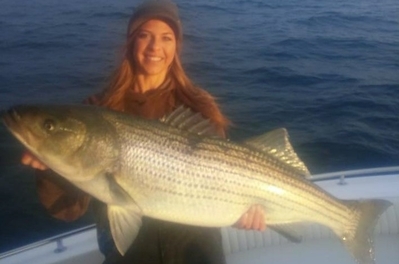 The Spring Tournament will include ALL Species of Fish, just get those "LIKES"
There are dozens of tournaments up and down the New Jersey Coast and almost all are won by someone killing the biggest fish and hanging it on a scale. This Fall Season I want to try and put together something that everyone can enter and that everyone gets to be a Judge. All you have to do is to catch a fish, get a picture of it and get your picture posted to my Facebook Page @ www.facebook.com/abseconbay . The picture that gets the most Facebook "LIKES" every week will win your choice of an Absecon Bay Striped Bass, Cotton T-Shirt or a Long Sleeve Performance T-Shirt. Remember all you need is a picture to win. Release pictures are very much encouraged and there is no need to weigh or measure your fish. You are welcome to ad a description or story as detailed or vague as you desire if you think it will get my FANs to CLICK the LIKE Button. This contest starts NOW and the first segment ends at close of business Sunday March 19. After that each weekly segment starts Saturday morning thru the following Friday. All "LIKES" will be totaled up and the winner will be announced the following Sunday or Monday to give the late week entries time to get all the LIKES possible. 1. Bring your Striped Bass to the store and have your picture taken here. No work for you, but give me some good information and I'll do my best to create a "Likeable Post". Even Better, Join me on a Striper Safari and I'll photograph your trip and put up some good pictures. 2. Go directly to my FACEBOOK Page. (Best Method) You Post your photos to the "Absecon Bay Timeline" along with a description, report or some comment about the catch that will catch my Fan's attention. I'll Share them on the timeline . 3. Send them thru the Facebook Messenger and I'll copy and paste them on the time line and get them out there to show them off..
4. Email your photos to go-fish@abseconbay.com. Be sure and put 'Striper' in the Subject line so I don't miss it. Include a report so I can help your cause. I'll be putting details on the Facebook Events Page so jump over there and CLICK the JOIN button and keep abreast of the action. This isn't 100% necessary to enter a photo, but if you do you'll show all your friends that you are In It to Win It. Feel free to SHARE your posts with your friends and get them to LIKE your Photo (on the Absecon Bay Facebook Page) to have a better chance to win. Last of all Play Fair !This contest is for FUN and of course a T-Shirt for the winners . PLEASE, if you do see a photo you LIKE, Go ahead and CLICK that LIKE Button, and send as many pictures as you want. Four ways to enter your "Best Catch"
1. Stop by Absecon Bay Sportsman Center and show us your catch and get your picture taken. 3. Send it as a Facebook Message. 4. Email your picture to go-fish@abseconbay.com . Please put "Striper" in the Subject line. In 2014, Michael Lakes won the first week segment of the "Absecon Bay Best Catch Striper Tournament" With 265 "LIKES". He won a "Absecon Bay Facebook Logo Sweat Shirt. I'm doing it again this year and this time Absecon Bay Sportsman Center Striper Performance T-Shirts are up for grabs. Win by getting your fish pictures posted up on Absecon Bay Sportsman Center Facebook Page . Michael Lakes won the first week segment of the "Absecon Bay Best Catch Striper Tournament" With 265 "LIKES" and counting. He wins a "Absecon Bay Facebook Logo Sweat Shirt. 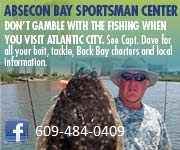 Be sure and get yours by showing off your fish on our Absecon Bay Sportsman Center Facebook Page .